Take heart, Red Sox Nation. After an abysmal stretch in which the Sox lost 10 in a row and looked like they’d never win again, the Old Towne team is suddenly looking more like the defending World Series champs and — in the midst of a seven-game win streak — looking like it can reel off wins on sheer will. That being said, two more wins will only get the team back to the .500 mark and there are plenty of holes still to patch up and repair in this 2014-model duck boat before Boston can vie for a spot atop the American League East Division. Still, seven straight victories after dropping ten in a row is a marked step in the right direction. The Sox hit .314 with runners in scoring position in the past week while still stranding 65 men on the bags in seven games. 1. Brock Holt, 3B: Let’s hear it for the kid. 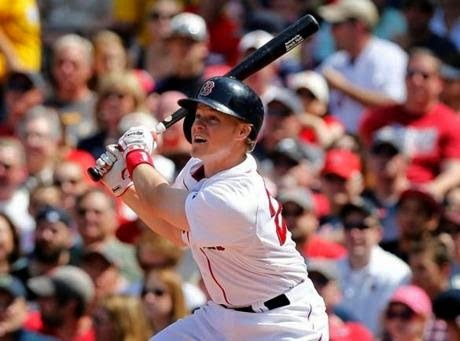 In the past week Holt made his name a much-loved addition to the Red Sox bit-player canon, going 12 for 32 (.375) at the plate with six doubles, one homer, five RBI and a stolen base. His high point was June 1, when he ripped four doubles in a game against Tampa Bay — becoming the first MLB player since former Sock Victor Martinez (June 1, 2010) to accomplish the feat. 2. Xander Bogaerts, SS: Bogaerts continues to shake off the cobwebs and show the same sort of chops he displayed in the 2013 postseason of late. Last week the X-Man was .367 at the plate with four doubles, two RBI and five walks. He’s now hitting .349 over his last ten games. 3. 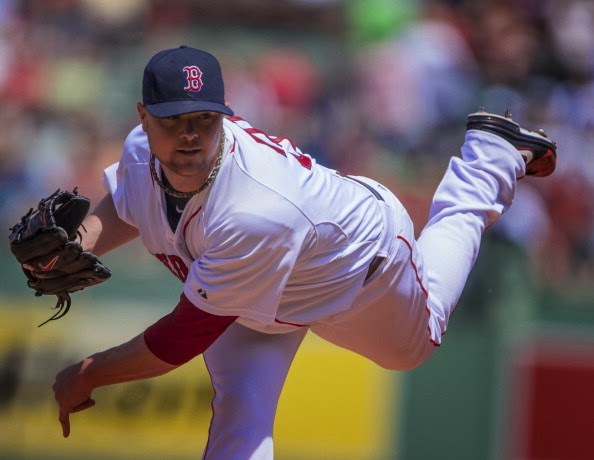 Jon Lester, P: Get this guy a contract extension, and pronto. Lester was magnificent again in two starts for the Sox this past week, going 2-0 with a 2.08 ERA in 13 innings, allowing a dozen hits and only three runs while striking out 19 and walking only four. His highlight of the two starts came June 1 against Tampa Bay, when the lefty twirled seven scoreless frames and allowed only four hits and one walk while striking out a dozen. Honourable Mention (tie): AJ Pierzynski, C: A.J. kept up the pace at the plate in the past seven games, hitting .409 in five games with one double, one huge, game-winning triple against Tampa Bay and four RBI. Rubby De La Rosa, P: Rubby ignored Kenny Rogers' advice and took his love to (Bean)town in his first start for the big league club in 2014, getting the win and going seven shutout innings while only allowing four hits and striking out eight against Tampa Bay on May 31. 1. Clay Buchholz, SP: Clay, Clay, Clay. We’re not yet sure if it’s physical or mental, but it’s clear that you’re not the same Buch that stopped the opposition so completely in the early part of 2013. And you’re not doing much to prove you don’t deserve that “Brittle” tag that has been affixed to you throughout your career. On May 26, Buchholz made one three-inning start against the Atlanta Braves and gave up six runs on four hits while walking eight and seeing his ERA rise to 7.02 before getting the hook. Two days later the Sox placed the right-hander on the 15-day disabled list with a hyper-extended left knee, and Buchholz met with former big leaguer Bob Tewksbury, the former mental-skills coach with the Red Sox. In his last four starts, Buchholz has allowed 19 earned runs on 33 hits and walked 15 in 18 innings. So far in 2014 he is only averaging five innings per start. This is Buchholz’s sixth career trip to the DL. May 28 — Before a sold-out crowd and prior to a 4-0 shutout of the Atlanta Braves, the “Idiots”, a.k.a. the 2004 World Championship Red Sox — Trot, Man-Ram, Schill, Pedro, Wake, Johnny Damon and the whole gang — returned to the diamond to receive a warm welcome from the Fenway faithful ten years after the Sox broke the 86-year World Series drought by beating the St. Louis Cardinals. May 1: Red Sox manager John Farrell, bench-coach Torey Lovullo, third-base coach Brian Butterfield and pitcher Brandon Workman were all ejected from the game following Tampa Bay pitcher David Price’s plunkings of David Ortiz and Mike Carp. The Sox got the last laugh, however, when A.J. Pierzynski delivered a walk-off, game-winning triple in the tenth inning. June 1, Brock Holt, 1B: 4-4, 4 2B, 1 R, 2 RBI, 1 BB, .337 AVG. May 26, Clay Buchholz, SP: 3.0 IP, 4 H, 6 ER, 8 BB, 4 K, 7.02 ERA. After a relatively trouble-free stretch on the injury front, Boston suddenly has more than its fair share of bruised-up Sox riding the pine. P Clay Buchholz (hyper-extended left knee), P Felix Doubront (left shoulder strain), C Ryan Lavarnway (broken bone in left wrist), 3B Will Middlebrooks (fractured right index finger), 1B Mike Napoli (left fourth finger sprain) and RF Shane Victorino (right hamstring strain) all are cluttering up the 15-day disabled list, while LF Mike Carp is expected to be placed on the DL as soon as today with a right foot fracture. Only Napoli, Buchholz and Doubront are expected back in early or mid-June; the rest are all TBD. The Red Sox embark on a nine-day road swing by taking a 12-12 record away from Fenway into Cleveland for a three-game reunion with Terry Francona and his 27-30 Indians starting tonight. After a travel day on Thursday the team arrives in Detroit for a three-game set against the 31-22 Tigers beginning Friday.